We are proud to launch Access All app for IOS. 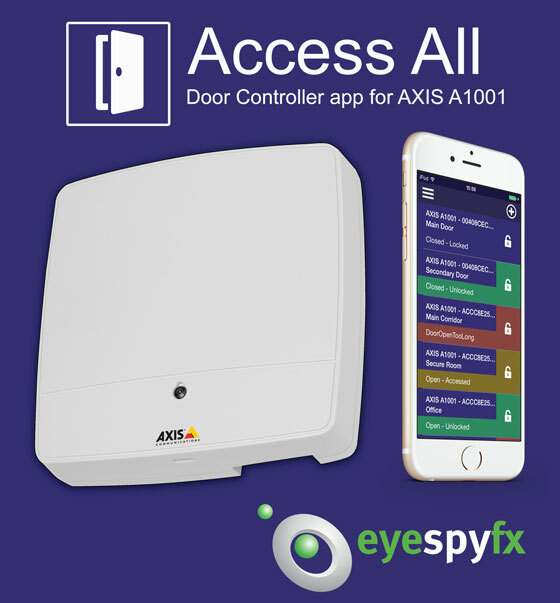 Access All allows you to remotely open doors using the A1001 Door Controller Unit from AXIS. You can also use the app to view access reports. As an introductory offer Access All is free to download and use. – View all your doors and their current status all on one list. – Individual colour coded status for Locked, Unlocked, Access and Alarms. – Includes an Instant Access button to unlock the door for a number of seconds, granting people entry. – Lock, Unlock and Access the door. – See the current status of that door. – View the door’s Event and Alarm logs. View the Event Log for each door. See the events from the door organised by date and filtered for your convenience. View the Alarm Log for each door. See only the Alarm stats that you pre-set up alerts for. The App works with any A1001 device, whether it’s in Standalone Mode or part of a System. Either auto-detect the A1001 devices on your network or manually enter their location. Then enter your your username and password to allow the App access the A1001 unit. Could IoT things be classified according to their instruction source rather than their function? Things can be combinations of the above and/or switch according to context.